Personalised It's A Boy Teddy Signing Plate is a china message plate is the perfect keepsake to remember that special occasion. 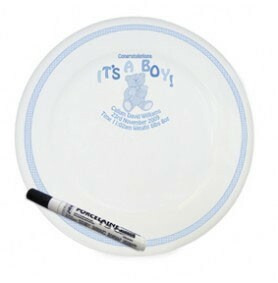 The words It's A Boy are standard but you can personalise this plate with a name, date, occasion, or weight at birth. Your message will be printed over 3 lines with a maximum of characters per line including spaces. Please enter these details into the text box below. This plate also comes with a special pen that your family and friends can write their own messages on the plate, once dry the plate can be placed in a conventional oven for 30 minutes and the messages become 100% permanent. Please enter these details into the text box below. Please allow 7 working days from placing your order for delivery of your personalised gift.